So, I figured I’d reward our three subscribers by putting up some new content 🙂 We’ve been super busy the last several days. Have we been out in the garden on these beautiful summer-like days? Nope. Making some delicious yummies from the produce we still have in the freezer? Nope. So what have we been doing? Well, here’s a picture of our living room. Understand now? Yep, we’re packing. Because we’re moving in two days! Nearly a full month ahead of schedule! After this weekend we will be living on the homestead! (That was a lot of exclamation marks! 🙂 ) About the only ones in the family who are not excited are the baby and the dog because they don’t understand it all. But both will be totally stoked once we get out there. Sid because he’ll have 40 acres to run and run on, and the baby because she loves to play in the dirt. We are so looking forward to being able to let our girls roam and explore without fear. Ok, I need to get back to packing. See you all later! And for those who subscribed, thanks! I’m honored. 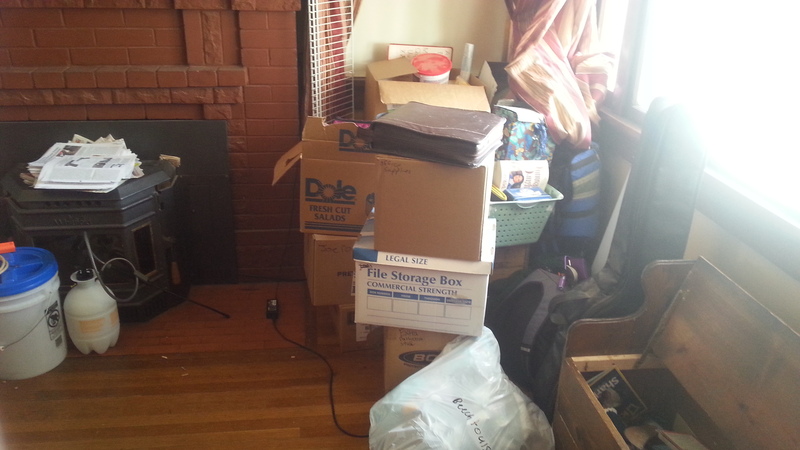 This entry was posted in Castle Rock Homestead, est 2014 and tagged moving on May 15, 2014 by Maridy.